what. i. wore. | a. lotta. color. goes. a. long. way. - bitte.und.danke. what. i. wore. | a. lotta. color. goes. a. long. way. Maybe it's just me, but I always find myself falling into a bit of a style rut during the latter half of the semester. As much as I hate to admit it, these are the moments when it legitimately seems like I have a closet full of clothes, but nothing to wear. In the midst of back-to-back blah ensembles, this particular look from a few weeks ago was a winner on all fronts. what. i. wore. I can already tell that this mint green button down from Anthropologie is going to become a weekly staple in my wardrobe. It's that versatile and effortless! As for the striped scarf, it's from J.Crew (last summer) — notice how I knotted the ends for a cool off-duty look. I've already commented on the following items in previous blog posts, but yeah, I'm still crushing hard over my J.Crew Factory field jacket and black jeans from Madewell. If you're in the market for a great all-around pair of ballet flats, then look no further than these pink Cece flats from J.Crew (see here for this season's revamped version of the popular flat) which are as comfy as they are cute. 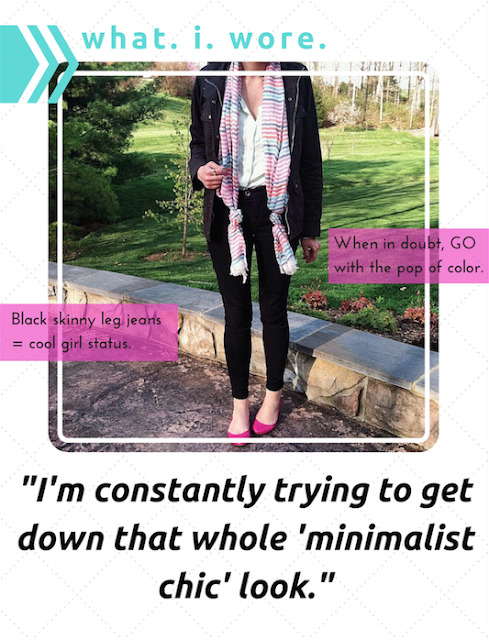 How do you overcome a style rut? Do you have a go-to spring uniform? Tell me in the comments below!